Sharing the trailhead with the popular Peralta Trail, this loop takes you farther east for a more challanging hike. Trail Description From the shared Peralta trailhead, make a right (instead of the Peralta left) onto the Dutchman's Trail #104 which gently climbs towards a pass over to the Barkley Basin. Descending into the Barkley Basin, you will be presented by the different views from other Superstition hikes. 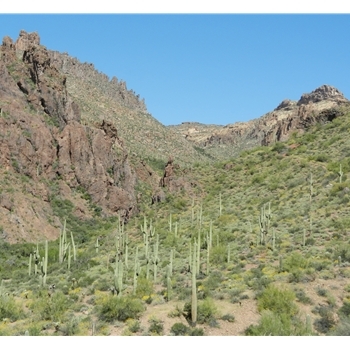 The views are more expansive, seeming to cover the entire Superstition Wilderness. The trail starts to gently climb over the next few miles towards the Miner's Needle rolling through a few washes; keep an eye out for snakes and other native critters (see Rattlesnake sighting). Around 2.5 miles, the trail starts to pickup elevation and wraps around the Miner's Needle. After about 3 miles from trailhead, you will intersect trail #108, make a left staying on Dutchman's Trail. For the next mile, you will follow a steeper canyon trail with wide open views to the left of the Miner's Needle. You will notice a few waterfalls (one being quite large) if you are lucky to go during the wet season. There is a very nice shaded lookout point once you wrap around the ridge (keep an eye out for balancing rocks on left) worthy of a break. This also marks the highest point on this loop. When you intersect with trail #238 heading to Picacho Butte, keep left on Dutchman's Trail. The next 1.5 miles is quite flat and you will make a left onto Bluff Springs Trail #235. Within another mile or so, keep left and stay on Bluff Springs Trail taking you into the Barks Canyon. This picturesque canyon has nice pools great for a small break and refreshing splash. Once you ascend the ridge out of Barks Canyon, you will start to steeply(!) descend all the way back to the trailhead. Accomodations: (on site) Toilets Water Directions: Take the US-60 to Peralta Road (just past mile post 204); Peralta road is about 8.3 miles from Apache Junction. Make a left onto Peralta Rd (North; FSR 77) and drive about 7.2 miles to the parking lot at road's end (at 5.5 mile fork, bear left keeping on FSR 77). Because of the popularity of this trail, there is overflow parking about 1/8 mile from the main parking lot (trailhead). The trail starts at the north end of the main parking lot. Accessibility: Good dirt road, off-road vehicle not needed.